This kitchen suffered from a lack of workspace, as well as outdated appliances and cabinetry. 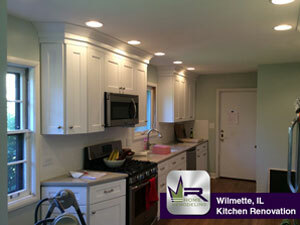 The homeowners wished to update the look while incorporating additional counters and more storage. The room was gutted, and the back door moved to allow for more surface area. 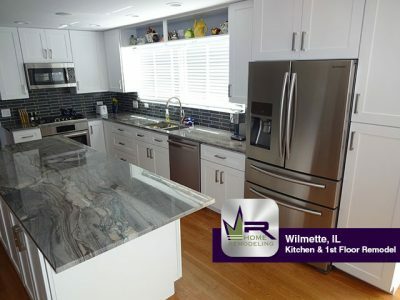 The homeowners were eager to change the layout of the first floor of their home by updating the flooring, cabinetry, appliances, and furnishings while increasing the use they would be able to get out of the space. The kitchen was very large with cabinetry and appliances spread along walls with a large and awkward space in the middle that was not often used. 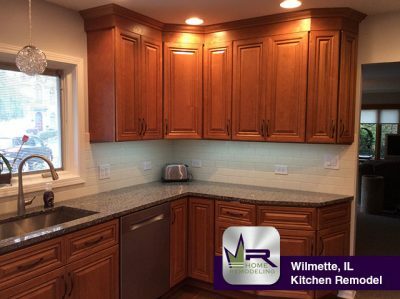 The original kitchen in this older home desperately needed updating. Everything was crunched into a small space, with doors on facing walls—one in from outside, the other leading to the rest of the house—making it traffic central.